Arthur van Hoff is CEO of Jaunt, a cinematic VR company helping to make such advice a reality. If virtual reality technology (VR) achieves mainstream popularity by 2017, as Van Hoff predicts it will, VR could manifest as a competitor, maybe even a threat, to the corporate travel industry. Traveling for business and immersing oneself in technology might finally become interchangeable. Intrigued? Here are five things to consider. 1. ‘Virtual reality traveling’ is becoming a thing. VR is no longer just for gamers. Several companies unrelated to video games are already incorporating VR into their sales platforms. And by doing that, they're targeting an emerging market of people interested in using VR to “go” places they’ve never been to before. VR companies and travel agencies are already teaming up to test how well these tactics actually stimulate travel sales. Spoiler alert: They work really, really well. Travelers previewing the Big Apple through a headset drove revenue from bookings for Thomas Cook up 190 percent. 2. VR conference rooms already exist. Travel takes up a huge chunk of most small and medium-sized businesses’ (SMBs) budgets. Theoretically, if VR could replace travel, it could free up all of this cash for companies to invest in their core business. Collaborative VR spaces are already in the works to make something like this possible: AltspaceVR has what it calls “Social VR,” where users can inhabit a virtual space with friends or colleagues. High Fidelity creates a similar communal space and uses sensors to translate a person's expressions and body movements into his or her avatar’s actions. If we have the technology to do that, and can save companies the wearisome time and money they spend getting to and from what can be very short meetings, why not? Of course, there may be more pushback from SMBs on this one. While VR travel might be advisable for large companies that can afford to buy in and maintain a “competitive advantage,” as Azizullah puts it, the transition to “holoportation” for SMBs is a more risky investment. 3. Here is what needs to happen before all client pitches go virtual. The VR in the market right now is not good enough to replace experiences for users. Though the combinations of Occulus Rift and Google Cardboard with an iPhone are impressive and can be fun to use, hardly anyone is going to prefer them to real life. Google, however, may just have achieved the necessary technological breakthrough to change this. During the last week of July, the company made a major advance in quantum computing, a technology that will enable engineers to build tiny processors with many times the processing power of the computers we know today. 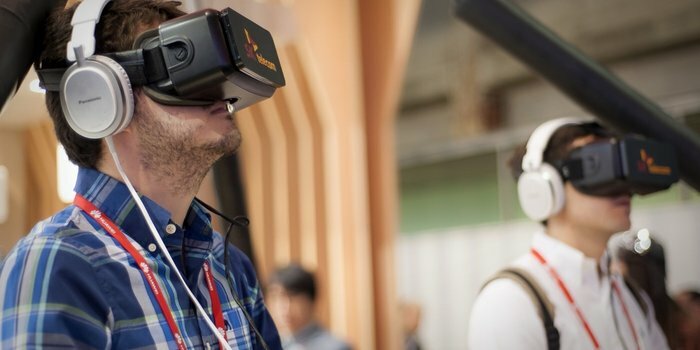 As soon as this technology is fit for mass production, it will allow VR to make a big leap forward. Hand-held VR devices will be significantly higher quality, maybe even capable of replacing reality, and even more compact than a smartphone. This “new level” of VR could then become convenient and affordable for consumers and businesses on a broad scale within the next five years. 4. SMBs will have a harder time replacing actual business travel with VR. Because developing strong relationships remains a crucial element of small business success, physical travel to meet clients will be a lot harder for SMBs to eliminate than it will be for Fortune 500 companies. The Holiday Inn Small Business Traveler Study confirmed this with the release of its results on July 25. In the study, more than 75 percent of SMB owners and employees surveyed reported that they got "more out of in-person client time than employees at larger companies.” Operating with tight budgets, SMBs have to continuously ensure that their expenses are properly prioritized. The steady increase of business travel budgets, however, indicates just how important it is for them to meet clients and business partners in person rather than through technology like Skype or FaceTime, though this technology is available. 5. There are some things VR might not be able to replace. Meeting in person creates a level of trust that technology simply cannot simulate. Personal interaction and physical proximity allow humans to connect and form relationships strong enough to drive business forward. Traveling for business or sending an employee indicates commitment to a business partner and reliability to a client. It is one of of the strongest expressions in the toolkit of business language. Replacing all this with virtual reality will be a challenge. But it just might happen.